Chugoku encompasses the entire western tip of Honshū, the Japanese main island. With the Chūgoku Mountains as the dividing line, the Seto Inland Sea (瀬戸内海 Seto Naikai) side is called the San’yō Region (山陽地方 San’yō-chihō), and the Sea of Japan side is called the San’in Region (山陰地方 San’in-chihō). 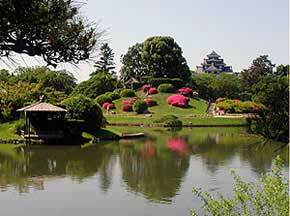 The principal city of the region is Hiroshima. 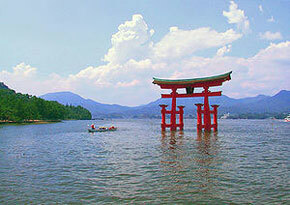 It is a mountainous region dominated by the Chūgoku Mountains and the highland Kibi Kōgen (吉備高原). There are numerous coastal plains, including the Okayama and Izumo plains, as well as many small basins in the mountains. The San’yō Region has more extensive plains than the San’in Region, and its population is also higher. The most densely populated areas are along the Inland Sea coast around the cities of Hiroshima, Kurashiki, and Okayama. The Inland Sea coast is a significant area of industry and commerce, with countless oil refineries, steel mills, automobile plants, shipyards, and chemical, petrochemical, and cement factories. In recent years industrial complexes of interrelated factories have been constructed along the Inland Sea. The Okayama plain and the coastal plains along the Sea of Japan are essential areas for the production of rice. The warm and relatively dry climate of the Inland Sea coast is also ideal for citrus fruits and grapes. The waters off the coast were once Japan’s richest fisheries, but catches have been on the decline due to industrial pollution. Chugoku translates as “middle country” and is written in the same kanji as China. Chugoku is generally considered very rural by Japanese, and offers an excellent glimpse into the countryside of Japan and see some of the traditional regional characters. Japan’s culture has been hugely influenced by Chinese and Korean culture over the centuries, and much of this arrived through the Chugoku region. There are numerous exciting sites throughout the area including one of the Three Great Gardens of Japan, Kōraku-en (後楽園) in Okayama. The islands between Shikoku and Honshū or Shikoku itself are can easily accessible by ferry. The area is sparsely populated. The main shinkansen line from Nagoya and Osaka runs along the south coast as far as Kyūshū and stops at Hiroshima. The north coast is less developed and has less sightseeing spots, but includes some of the most excellent museums and artworks in the country, and is also the home of pottery in Hagi – numbered as the second-best pottery in Japan after Kyōto. It is well worth slowly working your way along the northern coastline either on your way up to north Japan or when heading down to Kyūshū or on to Korea by boat. Temperature, rainfall and sunshine hours in Chugoku vary from the north to the south. The north coast has much more rain and snow than the south, and temperatures are a few degrees lower. Sunshine hours are relatively consistent throughout the year in both parts of the region, perhaps slightly lower on the north coast. Rainfall is heaviest in June and July, as the typhoon season reaches this area early in the year. At other times, rainfall is limited and should not be a significant problem for travellers. 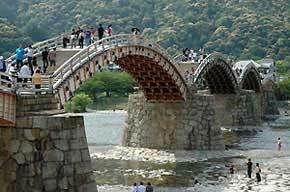 Below find a list of some of the most important sites to see in the Chugoku area.